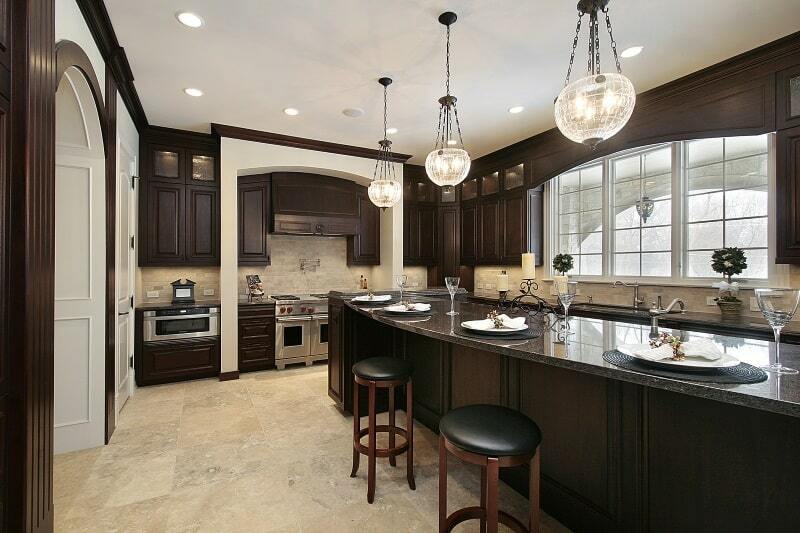 Bonjour and welcome to our Art of the Home gallery of gorgeous wood kitchen designs! We hand picked them just for you…hope you enjoy the visit! Wood kitchen designs can be used in a rustic or modern style. You’ll see several examples in our photo gallery below. 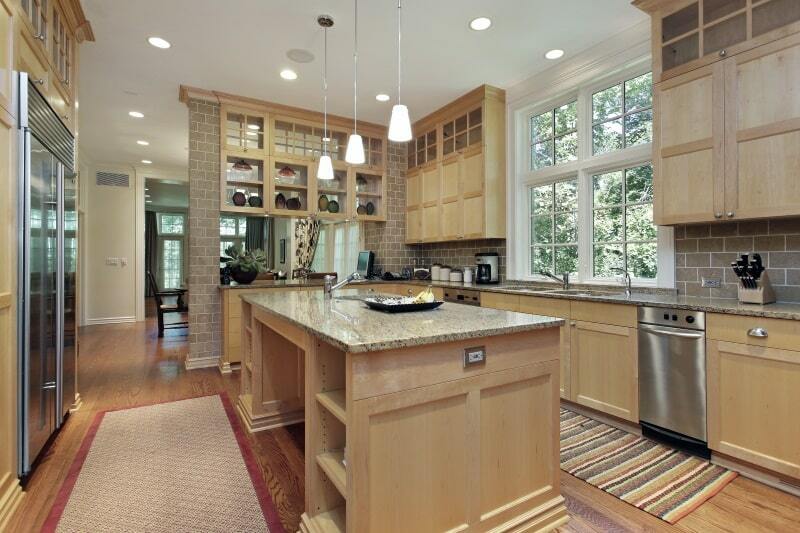 In all styles, wood kitchen designs add warmth and are so welcoming. You can play with flooring options, choice of cabinets and wood stains to give your dream kitchen the look and feel that brings you joy when you cook, eat and entertain. 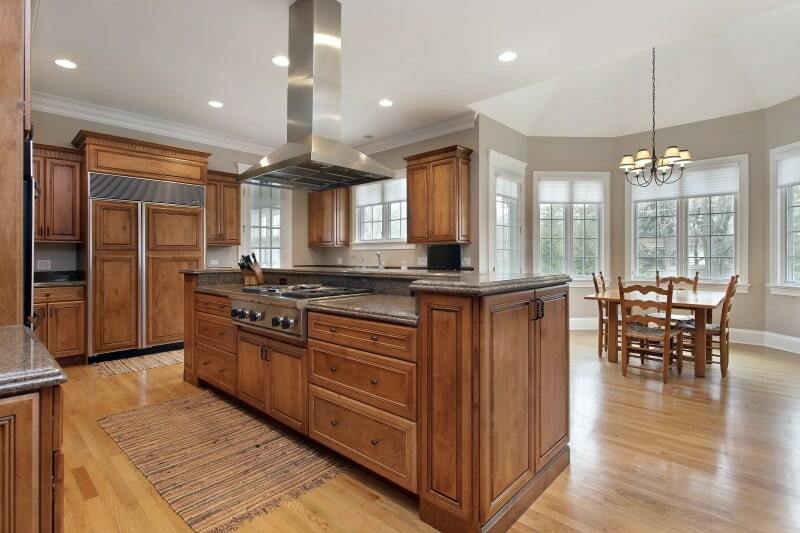 Natural stain and shaker style wood kitchen designs will tend to give your kitchen a more modern look. On the other hand, distressed maple cabinets will give your kitchen a more rustic and country vibe. 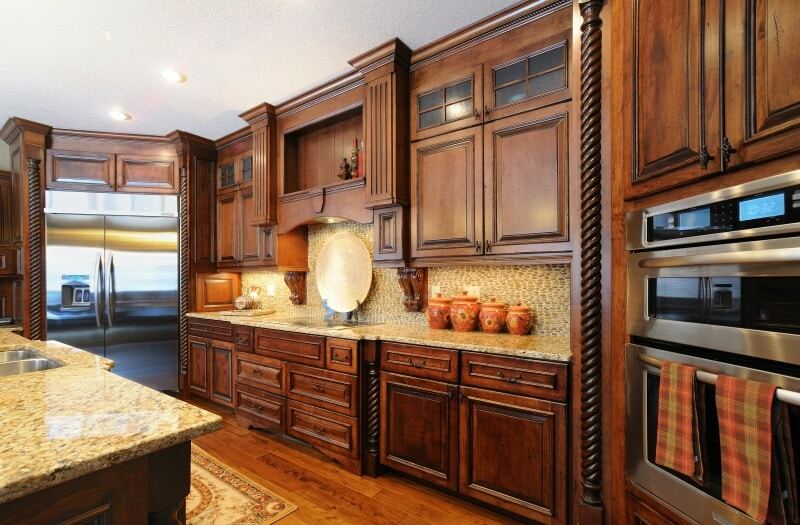 But again, you can totally play with decorative accents to give your wood kitchen the style that resonates with you. Now remember, wood is a breathing and living material so it brings with it a special soul that other materials, as beautiful as they may be, won’t…can’t. It will age, but that’s the beauty of it! So let’s check out these beautiful wood kitchen designs. We hope you will be inspired by our selection and get some good ideas with our “The Little Plus.” Enjoy the visit and beautiful day to you! The Little Plus: this golden brown wood kitchen features a functional cooking island with a two-level granite countertop. It’s a good thing the hardwood floors have more of a natural stain so it lightens up the room. And look at this professional looking island mounted range hood — let’s start cooking! The Little Plus: this dark cabinet kitchen has crown molding going up to the ceiling which makes the entire kitchen look larger and in addition minimizes dusting…got to love that! The double sink granite countertop is in light beige which goes very well with the dark wood cabinetry and the golden brown hardwood floor. The pebble design of the backsplash is refreshing and using a plate behind the stovetop to prevent grease splashes from staining the backsplash grout is a really good idea — nice design element and easy to clean! The Little Plus: the brick pillar next to the see-through cabinets and the backsplash accent wall in the same pattern brings character and a rustic touch to this otherwise modern kitchen. And notice how the floor rug adds a splash of color and the darker wood floor provides a gentle contrast to the natural wood cabinets. Also, the large four-panel window above the sink is a great idea — brings in natural light and adds a touch of luxury to this shaker style kitchen. The Little Plus: the arched transom window above is beautiful and brings in more natural light than the double window alone would — always a plus! Also, did you notice that the backsplash used a subway-tile pattern but the owner chose larger tiles for this design. The lighter grey shade of the backsplash offers a gentle contrast to the darker marble countertops of the cherry wood cabinetry and center island. 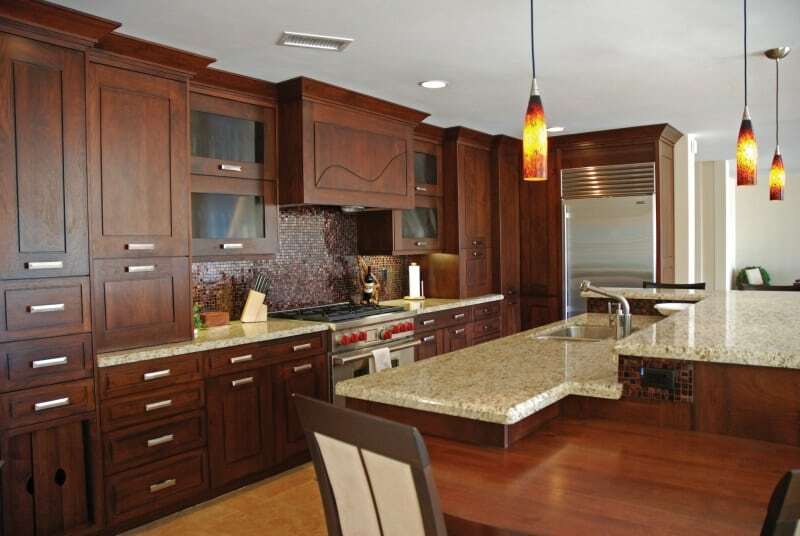 The Little Plus: this modern dark brown kitchen features a three-level island. The top level is perfect to entertain or enjoy a quick breakfast. The second level has a double sink and can be used for food prep. The third level is perfect for homework time! 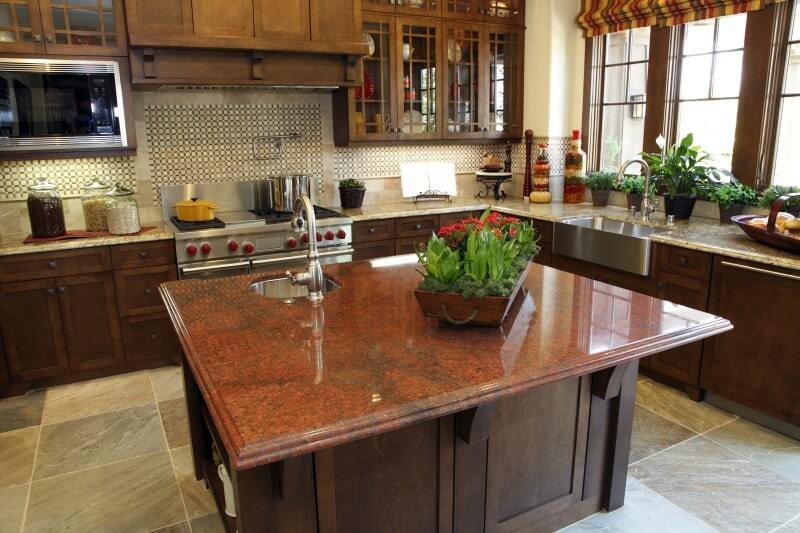 The Little Plus: the elegantly edged, terracotta kitchen island countertop is gorgeous. It was bold to use that color in a kitchen with dark cabinets but it works well in this kitchen thanks to a lighter, rich in hues, slate floor. 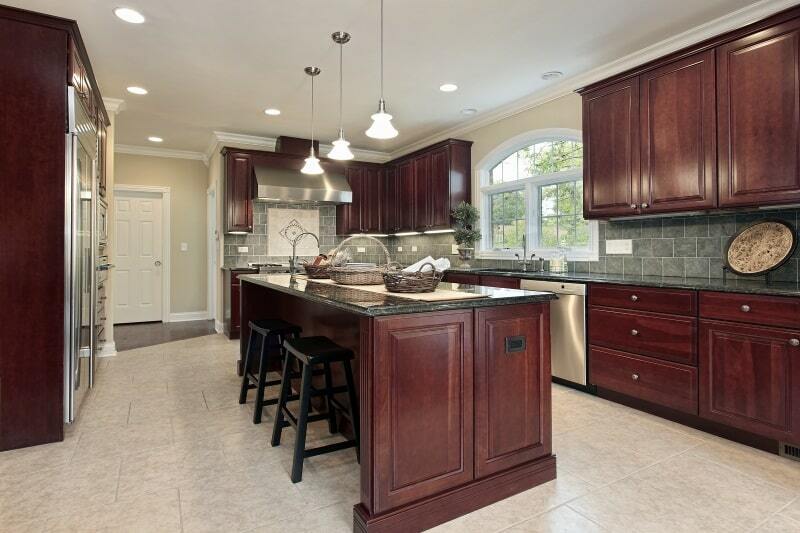 The beige granite countertop also contributes to lightening up the color palette. And what a good idea to frame the backsplash over the cooktop with tiles that match the countertop — it breaks the pattern which could look too busy if left alone. And of course, love that Le Creuset pot! We regularly cook both braised carrots and braised carrots with cream in this one (same size & style but different color, ours is “flame”). The Little Plus: the backsplash adds gorgeous tones with reddish, brownish and greenish hues which all call back the island countertop, cherry finish cabinetry, and hardwood floor. 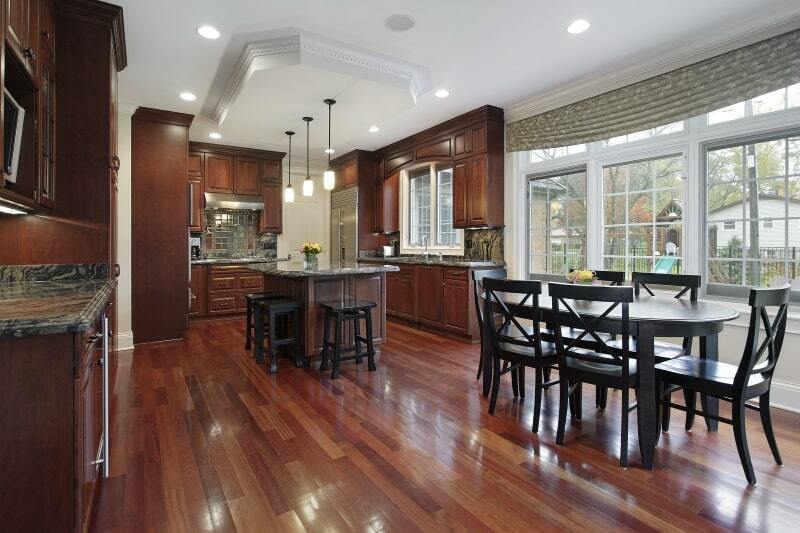 The reverse tray ceiling with crown molding reigns above the kitchen island and gives it some gravitas.